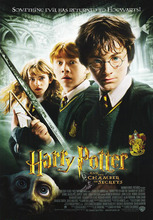 It is Harry Potter's second year at Hogwarts, and a mysterious force is attacking fellow students. We also meet Gilderoy Lockhart, the Defense against the Dark Arts teacher and charming narcissist. It is a bit darker than the first installment, though every bit as outstanding.